In Revelation 7, we are given a vision of a great multitude that no one could count, from every nation, tribe, people, and language standing before the throne of the Lamb — wearing white robes which were washed and made white in the blood of the Lamb. Robes are made white by washing them in blood? How does this happen? We know how blood stains white garments. Unless you immediately get to those stains with the right cleansing aids you may never see that garment as white again. 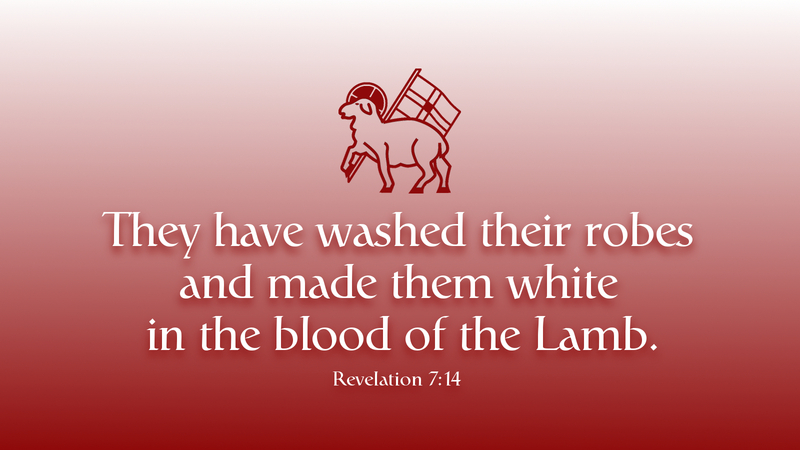 So what is it about the Lamb’s blood that can make them white? This isn’t any regular lamb we are talking about. In John 1:29, we are introduced to Jesus as “the Lamb of God, who takes away the sin of the world!” Try as we might, you and I cannot scrub away the sins of our past, present, or future. Jesus’ blood is the only agent that can wash away the deep, penetrating dirt and stains of your sin-soaked robe. Jesus is the Lamb of God, sent to atone for your sin. Turn, from your preoccupations with your sins, to Jesus, and be washed of your sin stained life — forever. Prayer: Redeeming Lord of all, help me to break free of my sins, turning to you, so that I may grasp your forgiveness, peace and freedom. Amen.